The Nike Air Sport Carry III Golf Bag is made with ultra-lightweight, durable materials and highly specialised compartments for easy carrying and organisation through your round. LIGHTWEIGHT, CUSTOMISABLE STORAGE. 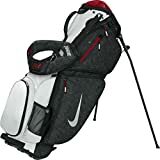 The Nike Air Sport Carry III Golf Bag is made with ultra-lightweight, durable materials and highly specialised compartments for easy carrying and organisation through your round. BENEFITS: Durable, lightweight construction for lasting use and easy transport. Eight-way, three full-length divider system for organising clubs. Nike EquaFlex revolving double-strap system for comfortable carrying. Water-resistant, fleece-lined pocket helps protect valuables Full-length apparel pocket, insulated cooler pocket and quick-access drawstring pocket for dedicated storage Integrated GPS loop, pen sleeve and glove patch keep essentials close at hand. PRODUCT DETAILS: Custom grip leg endcaps. Matching rain hood included. Zip-off ball pocket. 21.5cm oval top.